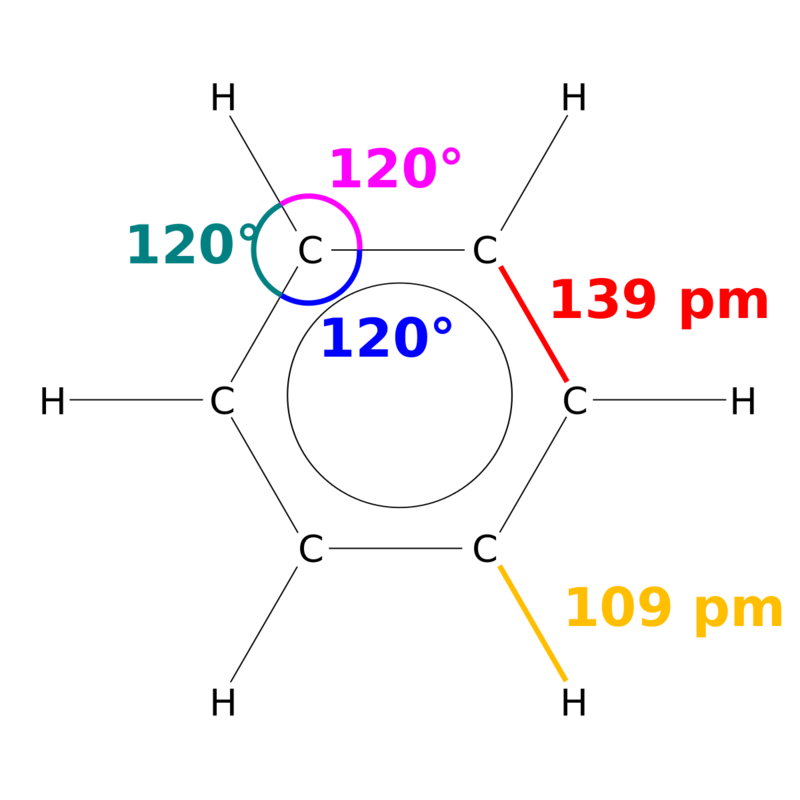 X-ray diffraction shows that all six carbon-carbon bonds in benzene are of the same length, at 140 picometres (pm). The C–C bond lengths are greater than a double bond (135 pm) but shorter than a single bond (147 pm). This intermediate distance is consistent with electron delocalization: the electrons for C–C bonding are distributed equally between each of the six carbon atoms. Benzene has 6 hydrogen atoms – fewer than the corresponding parent alkane, hexane. The molecule is planar. The MO description involves the formation of three delocalized π orbitals spanning all six carbon atoms, while the VB description involves a superposition of resonance structures. It is likely that this stability contributes to the peculiar molecular and chemical properties known as aromaticity. To accurately reflect the nature of the bonding, benzene is often depicted with a circle inside a hexagonal arrangement of carbon atoms. 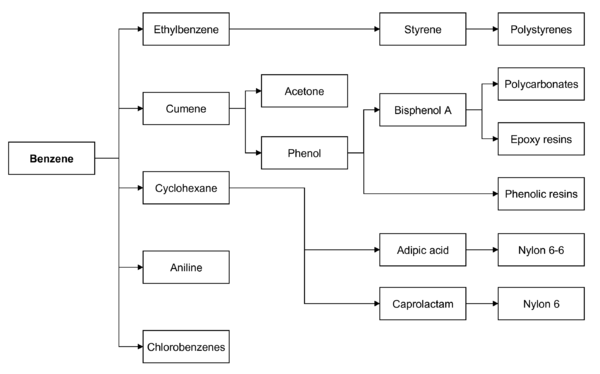 Although of no commercial significance, many other routes to benzene exist. Phenol and halobenzenes can be reduced with metals, for example. Benzoic acid and its salts undergo decarboxylation to benzene. Via the reaction the diazonium compound with hypophosphorus acid aniline gives benzene. 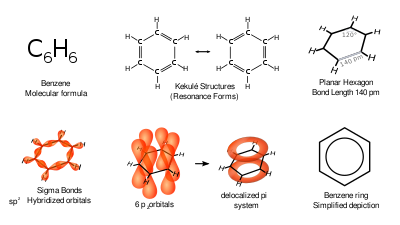 Trimerization of acetylene gives benzene. Benzene is used mainly as an intermediate to make other chemicals, above all ethylbenzene, cumene, cyclohexane, nitrobenzene, and alkylbenzene. More than half of the entire benzene production is processed into ethylbenzene, a precursor to styrene, which is used to make polymers and plastics like polystyrene and EPS. Some 20% of the benzene production is used to manufacture cumene, which is needed to produce phenol and acetone for resins and adhesives. Cyclohexane consumes ca. 10% of the world's benzene production; it is primarily used in the manufacture of nylon fibers, which are processed into textiles and engineering plastics. Smaller amounts of benzene are used to make some types of rubbers, lubricants, dyes, detergents, drugs, explosives, and pesticides. In 2013, the biggest consumer country of benzene was China, followed by the USA. Benzene production is currently expanding in the Middle East and in Africa, whereas production capacities in Western Europe and North America are stagnating.